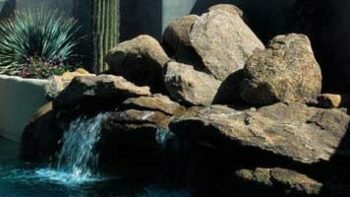 Rock installations: These are great for reducing water usage in water features. We can also install rock covered areas using a variety of sizes, textures, shapes, and colors to create unique patterns and features that provide both secondary and primary focal points. Boulder installations: Boulders offer an incredible look. 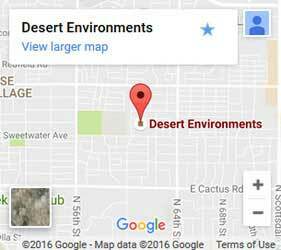 They provide a zen-like merging of the Arizona landscape and your personal property. We use them to great effect, and make your yard feel like a living and breathing ecosystem. They're also maintenance free. Granite installations: Granite is an incredibly versatile material. We can install granite slabs, benches, and other permanent fixtures, or use it as a ground cover in the form of decomposed granite. This provides a low maintenance cover for pathways, sitting areas, yard boundaries, and much more. Take advantage of these low water features. 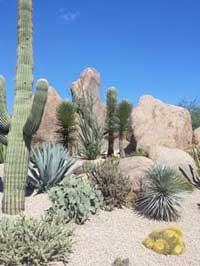 Xeriscaping is the art of creating minimal or no water landscaping. Rock features are an excellent way to fill space with artful, natural forms that don't require the same attention as plants or grass. We know how to work with these features to create stunning, vibrant areas that help bring your yard to life. Contact us for rockscaping today. You know how to get the yard you want. Low maintenance, low water, and all natural rockscapes are exactly what you've been looking for. We'll design the perfect rockscape with you, install it, and teach you how to maintain it. It couldn't be easier, so call or contact us today.